And why do we keep trying to change Him? It’s becoming so clear to me how crucial our search is. And it’s one that we make alone. No one can pursue God for us. Just like we choose how we are going to live, the decision is entirely and exclusively ours. That was the first time I really understood that scripture from Philippians 2:12 and today, as a mother of children who are on the brink of adulthood, I know it even more to be true. Many arrive at different conclusions. Some are atheists who deny the existence of God. To them, he just isn’t. Some are Jehovah’s Witnesses who allow the interpretations of their organization to define God for them. And still some others believe that there are multiple ways to reach God. Just pick one deity or pick them all. Many people attempt to define God – we’ve all done it most likely. We try to shape the parts of him that we don’t comprehend into something we can understand. We want him fit into the mold that we’re comfortable with. For some reason, my daughter is infatuated with the first chapter of the book of Job. Often, when she catches me reading my Bible, she asks me if she can thumb through and look for it. But more than once, she’s gotten stuck on the verse where it says that Job “feared God.” Sometimes I think she wonders if she read that right. Fearing God can mean a lot of things I think, but one of the most important is that he’s so hugely powerful, human hands can’t shape him. Theologian, R.C. Sproul in his book, “Who is Jesus,” feels that one of man’s biggest mistakes is trying to make Jesus into who we want him to be. And Christ is only found by using the Bible as our guide. Through it, we can understand the truth. 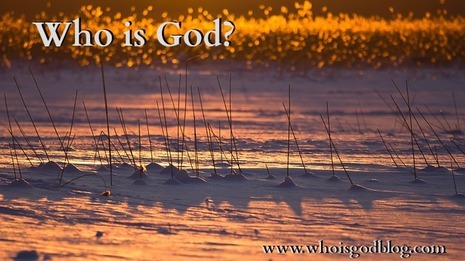 And in it lies the answer to our “Who is God?” question. I had a friend once whose beliefs were all over the spectrum. When I would try to get her to understand who God really is, I would get frustrated because her beliefs had no base. There was nothing to ground them on. When I shared my concern about her to a mature Christian friend, he asked me if my friend believed the Bible to be true. When I said, no. He told me that arguing spiritual truths with her was fruitless, because she had no standards for her belief. I spoke with another friend recently who has decided to explore her spirituality. I was glad for her decision, but hesitant as to how she intended to go about her journey. In our talk, I gave her my testimony and invited her to explore God using the Bible as her anchor. “Oh, I could never use just one book to do that,” my friend said. She explained that she was open to the truths and writings of all the religions. Saddened, I knew then that our discussion was over. If she wasn’t going to use the Bible as her exclusive guide, then she wasn’t going to find the true God on her journey. It’s a question we all face and the answer is something we need to discover on our own. But we’re not left without a guide – the reliable and true Word of God. Without it, we are lost. 31 But these are written that you may believe that Jesus is the Messiah, the Son of God, and that by believing you may have life in his name.